Chapter 1. 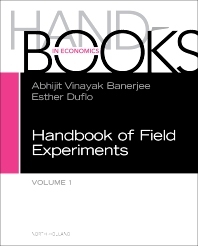 An Introduction to the "Handbook of Field Experiments"
1. Why Focus on Welfare? 4. Interpret: How Do Investigators Construe What Matters in the Data? 2. How Do Experiments Address the Problems in the Prior Voter Turnout Research? Handbook of Field Experiments provides tactics on how to conduct experimental research, also presenting a comprehensive catalog on new results from research and areas that remain to be explored. This updated addition to the series includes an entire chapters on field experiments, the politics and practice of social experiments, the methodology and practice of RCTs, and the econometrics of randomized experiments. These topics apply to a wide variety of fields, from politics, to education, and firm productivity, providing readers with a resource that sheds light on timely issues, such as robustness and external validity. Separating itself from circumscribed debates of specialists, this volume surpasses in usefulness the many journal articles and narrowly-defined books written by practitioners.